Throw chicken and a few Asian flavours into your slow cooker, turn it on, and go about your day. When you get back home, sprinkle bowls of chicken with scallions and sesame seeds… and you’ve got a Korean style dinner that looks like you spent hours making it! 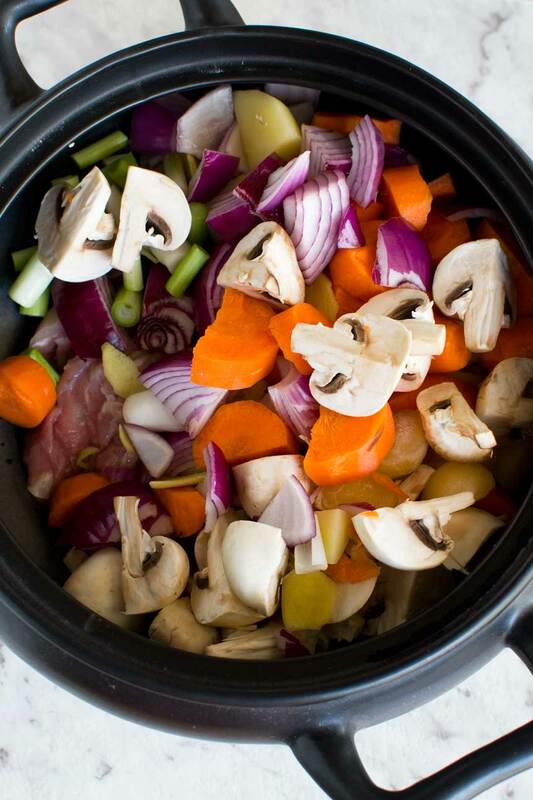 As we all know, slow cookers are perfect for people who don’t have much time to cook. So probably most of us on an average week night! Seriously, though, aren’t slow cookers just the business? Even if you prepare and chop the ingredients in the morning, it still feels like the meal cooked itself when you open the door that night and smell the loveliness pervading your home. So why don’t I use my slow cooker more? I use it for this yummy Olive Garden copycat crockpot chicken gnocchi soup and that’s about it some years. Mostly I don’t feel like I have many slow cooker recipes, so when I spotted this on the Korean recipe blog My Korean Kitchen I decided to give it a go. And… Korean! That’s something I haven’t tried before in any shape or form. 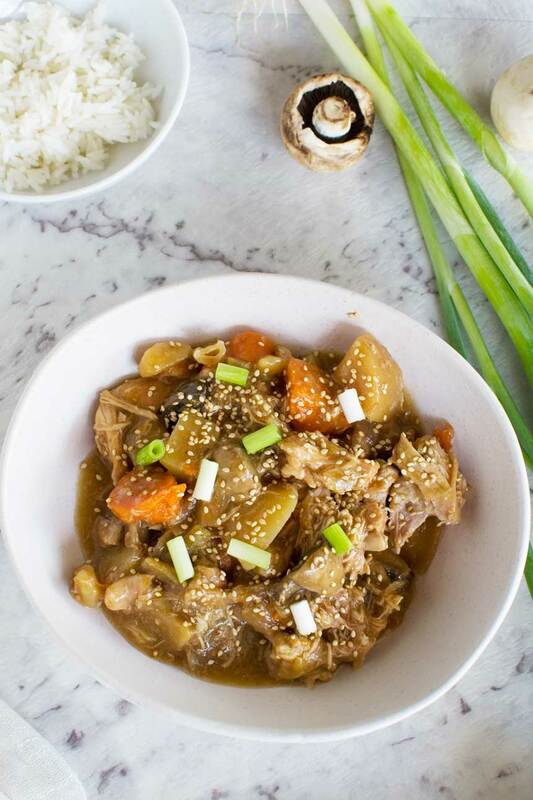 Apart from the lovely sounding Asian flavours, what attracted me to this recipe is the fact that you dump everything in the slow cooker, switch it on and leave it. No pre-cooking of anything required. I did adapt the recipe a little from the original. I skipped the chilies, but only because I thought I might give some of the finished meal to my baby. If you don’t have anything against chilies, keep them in the recipe for a bit more pizazz. I also added in more vegetables for a better balanced meal. 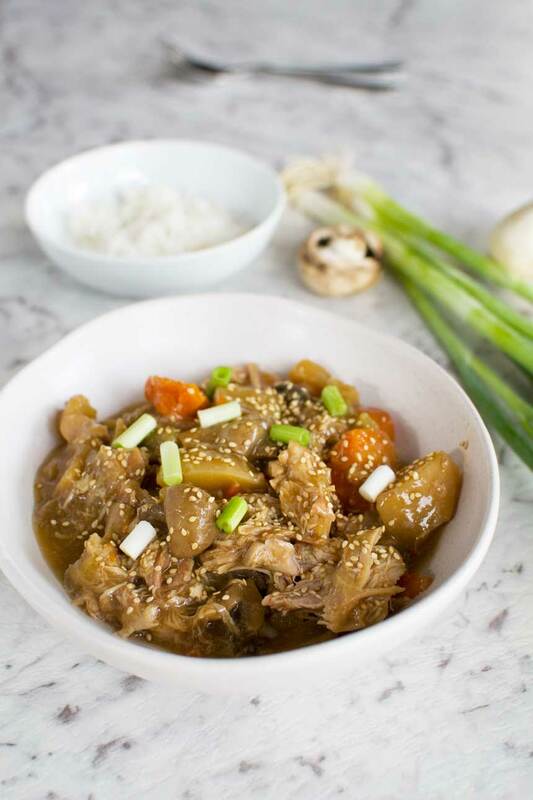 Apart from those little tweaks I kept this slow cooker Korean chicken recipe virtually the same. I served it with rice, and it was absolutely delicious. The flavours aren’t too ‘in your face’. They’re quite subtle, because they’ve been mixing with the chicken juices all day. And in fact now that I think about it the sauce is very much like a mildly flavoured homemade teriyaki sauce. The ingredients are similar – soy sauce, oyster sauce, garlic, rice wine, and brown sugar. The spring onions and sesame seeds scattered over this dish when you serve it take it to the next level. 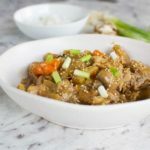 Suddenly it isn’t just another average brown casserole cooked in the slow cooker – it’s a delicious oriental delicacy that looks like you slaved away over it for hours! Just chop up a few vegetables and throw in your slow cooker with some chicken thighs and simple Asian flavours for a delicious Korean chicken dinner. Place the chicken, vegetables, garlic, ginger, and chilies (if using) into the slow cooker. Combine all of the sauce ingredients and pour over the ingredients in the pot. Cook for 6 hours (low) or 4 hours (high). About half an hour before the end of the cooking time, slowly stir in the cornflour and water to thicken the sauce. Just before serving, stir in the sesame oil. Sprinkle a chopped spring onion / scallion or two and some toasted sesame seedsh over every serving of chicken. Recipe based on this one on My Korean Kitchen. I bought my toasted sesame seeds at an Asian supermarket, but if you can’t find any it’s easy to toast your own in a dry frying pan. It just adds an extra step to the recipe of course, so definitely ready toasted are better! I usually serve this delicious Korean chicken with rice. I allow ½ cup per person. Like most people, I’m usually guilty of making too much rice – although you can always make fried rice with the leftovers! I didn’t have any cornflour to thicken the sauce the first time I made this, so I used ordinary flour instead. Worked just fine! I really look forward to your recipe e mail posts and I only seem to use my slo cooker in winter . My traditional stews always look the same shade of brown what ever the meat. Good fresh recipes are hard to find so I am impatient to try your fresh vibrant Korean recipe. Thank you for reviving my interest in slo cookers again. Hi Barbara! Thanks so much for taking the time to leave this lovely encouraging comment. Sometimes I forget there are real people reading (and appreciating – yay!) the blog, so it’s really great to hear it from time to time! Sorry the recipes have been coming a bit slowly lately. We’ve had an incredibly busy year with the birth of our son and yet another move abroad, but I’m hoping that things will pick up again in time! Take care! This looks like really good takeaway but from the slow cooker. This is a great idea and I’m all about adding more veggies. Yes, I thought I might as well up those veggies a bit! I love your non-spicy variation! This looks absolutely delicious and so tender! Aw, thanks so much for the recipe, Sue. I really enjoyed sharing this delicious recipe from a fabulous food blogger like you! This is SO genius- such a great recipe to have back pocket for those crazy days that leave you with the least time and the biggest appetite! Dishes like this are just like magic aren’t they? I’m saving this for one of those crazy weeks coming up. Thanks Helen! You’re welcome, Lorraine. Merry Christmas! My mouth is literally watering, Helen! And I’m with you on loving slow cooker recipes, especially for those days when you only have one hand available! 😉 Put this one on next week’s menu – thank you my friend! You’re so welcome, Marissa. Hope you enjoy it! Hope you do give it a try, Mira! I have just demolished a bowl of your Korean Chicken (mine really!). I erred on the side of caution with the sugar as not a sweet tooth so cut it by half and pleased that I did. The other thing I noticed is that there was no onion in the ingredients list but I chucked one in anyway. It shows onion in the uncooked photo above. All in all I thoroughly enjoyed it so thank you again Helen for another great recipe. Oh Ann, you are right, I forgot the onion in my ingredients list! Thank you so much for pointing that out! So glad to hear you gave this a go. Good to hear that it tasted fine with less sugar too! I’ve just made this and it was delicious! I love chillies so added 3 dried birdseye chillies and that was just right in terms of heat. I didn’t add the potatoes as I wanted to serve it with rice. 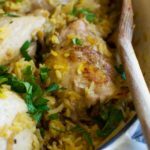 I’m always on the lookout for great slow cooker recipes, I will definitely make this again, thank you. Oh, you’re so welcome, Jenny! I’m so happy you enjoyed this, and thank you for letting me know. You’ve made my day!